Band leader Billy Corgan reportedly worked nonstop after his band's Siamese Dream tour and wrote about 56 songs for the Smashing Pumpkins' 'Mellon Collie and the infinite sadness' album. As the Mellon Collie sessions came to a conclusion, '1979' was just a couple of chord changes and a snippet of a melody without words. When the time came to choose the songs that were to appear on the album, producer Flood said that '1979' was not good enough and wanted to drop it from the record. This inspired Corgan to finish it in four hours. The next day, Flood heard '1979' once and decided immediately to put it on the album. 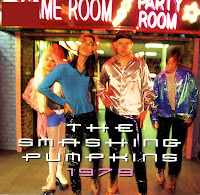 The song features a sample of Corgan's voice repeated throughout. During recording, Corgan was singing "ooh" as the melody line, so he and Flood decided to record him singing to a tape. The pair electronically manipulated several samples and looped them against a drumbeat. The single was the band's first international big hit, peaking at number 16 in Australia and the UK and number 12 in the US Billboard Hot 100.